Get ready for #ScaryMovieMonth 2016 with Patrick and Doug! I'm on a big Stephen King kick right now, it'd be cool to hear a podcast with you guys talking about a bunch of Stephen King movies. Talk about your favorites and least favorites and maybe your favorite books of his. That show is already in the works! Cronenberg directed, hope that film comes up! Was that this years first 7 word review? Yup. Math checks out. Awesome. I was actually thinking of suggesting a double feature of Christine and Cujo. Looking forward to it. Chopping Mall was one of those films I watched over and over as a kid. I'm a bit nervous to revisit now as I don't want to ruin my memory as how much I loved it. Amped up for SMM! Dracu-Doug needs to host public domain horror films on the F This Movie YouTube channel. This must happen! I've never known how bad I needed this until now. He's the Joe Bob Briggs of the next generation. It's a good thing vampires are immortal. I can't get off work and listen to this soon enough. 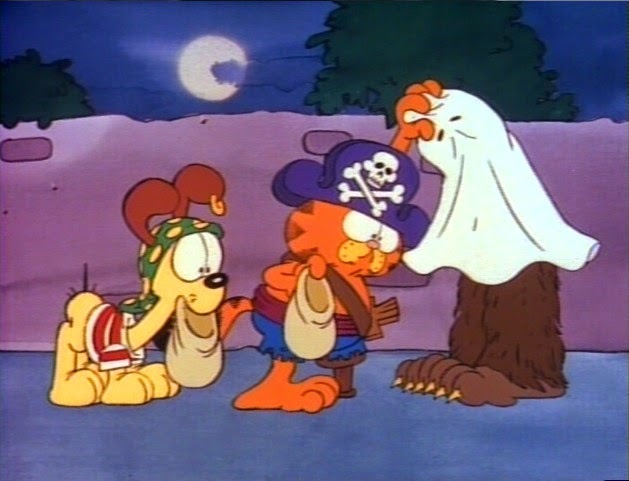 Also, I vividly remember being freaked out by pirate ghosts or something and a creepy old man in the Garfield Halloween special. Awesome. Awesome. Awesome movie. I second. The source comic strip book was pretty spooky too. You might not like it but you might love it could be said of every movie ever. The only way to settle this is the Boomerang test. If the movie looks more interesting to you than Boomerang, you should watch it. had a sleepless night today. At 5 am, this podcast dropped, listened to it, and laughed my *** off. had breakfast and fell asleep. now I will have to go to bed later to catch up my work. But the podcast made my day. Dracu-Doug at 5/6 am without sleep is an amazing thing. Wow, never knew Hooper directed the pilot to Freddy's Nightmares. That's probably the best episode by far in that odd series. Just seeing the Garfield's Halloween screen shot sent a thrill through me!! My mom would bake caramel rolls and we would watch that after trick or treating every Halloween (along with the Disney special that had the excellent version of Sleepy Hollow). Now I have my nieces and nephew over for a spooky scavenger hunt and park them in front of Garfield while I hide clues all over the terrifying warren of basement rooms under my apartment building. Orphanage is a stone-cold classic. Lovely and sad lead performance, but man I'll warn any parents that it's a rough one in that respect. Anyone have a guess on this year’s commentary movie? I’m going with Pieces. Basket Case 3. And I plan to watch ALL the Hellraiser movies in anticipation of Patrick's and Mike's "franchise" podcast. We are not doing the Hellraiser series. Just wanted to warn you before you put yourself through that. I hoping it's my SMM Franchise pick - Final Destination - though Hellraiser was actually my guess. As for the commentary I wouldn't even hazard a guess. Ah, what the hell, The Stuff. Ha! Hellraiser franchise would be a tough 9 movies. If you throw it down Paul, I salute you. Final Destination podcast seems like it may be the sweet spot between movie count and quality. Nice pick. Or Patrick and Mike are just over it and they give us the Conjuring Franchise. This was a terrific podcast, you guys. I found it both informative and entertaining and I really, really enjoyed listening to it. Please keep that in mind during this next part where I disagree with things you said. Universal's The Mummy is absolutely worth a recommend. Karloff's Frankenstein is deservedly iconic, but Karloff as the Mummy is a standout performance, so awesome with his icy, menacing deviousness. It’s not a boring movie at all. The Omen is totally worth seeing, as one of the best, or at least biggest, among the ‘70s Satanic horror craze. It has some real trippy death scenes, too. (The Omen’s ‘70s hair and fashion might be too distracting for some, though.) Actually, the Omen 1-3 trilogy ties together very well, continuity-wise, so you can watch all three as one epic saga. I haven’t seen The Peanuts Movie yet, but Doug’s description tells me that the movie takes a page from 1977’s It’s Your First Kiss, Charlie Brown. So, there is something of a precedent for this type of ending in Peanuts media. I really liked The Omen, and I hope to visit the sequels next month. I hated the Peanuts movie. I had forgotten my distaste for it, and would have walked out except my kids were with me. I instead took 4 bathroom breaks to ease the boredom. Woah, I had never gotten the Prince Fuckwad joke - mind blown, Doug! Thanks for humoring us! And thank you for having so much vintage furniture. It's a big help. I can be a BIG help with '80s and '90s bonkers. That's my jam. The Omen is my favorite horror movie! I'm not religious at all but the devil aspect is done well. You never see the him but his presence is felt everywhere, even in nature itself. It's a version of reality where Satan is in control. Recommended. I promise to watch it! Before Mirrors, even. Out of an insightful and great podcast, my one take away: I can watch Hocus Pocus for scary movie month?!?!?!??!?!?!?!?! Happy Sequel (not that I ever need an excuse). Clearly Patrick and Dracu-Doug need to watch The Omen for their Scary Movie Podcast. I was wondering where that house metaphor was going, hah. I'm excited! I'm kind of a chicken with horror, so there's a lot that I haven't seen. My loose plan involves some of this year's horror movies (The Witch, Neon Demon), some Vincent Price, and as much Universal horror as I can get my hands on. This episode was surprisingly informative (sorry, Doug). I was going to ask if you guys could put up a list of scary movies you can watch with your kids to make them little horror fans, so I'm glad to hear that it already exists. Cat People has been on my watch list, but I didn't realize it was a horror movie, so it's been moved up. I hadn't thought of Hocus Pocus in so long, I may try to watch it this month. And it reminded me of a Sandra Bullock/other famous actress movie where they're sisters and witches? I remember watching the animated Sleepy Hollow as a kid and being spooked. It wasn't so much seeing the headless horseman as much as the music really gave the impression that he was an unstoppable force. But again, I scare easily so perhaps your kids are braver than I. And I just realized what I forgot to get on my shopping trip this morning: monster cereal. This must be remedied immediately. Yeah, it was my favorite part of the episode. I am in tears at work right now.